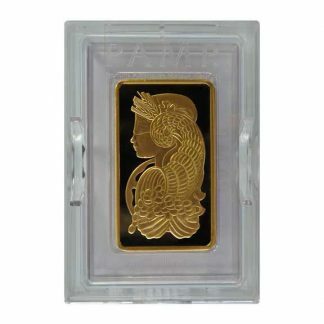 When investing in the precious metals by weight, the PAMP Suisse Gold Bar 100 g (3.215 oz) is difficult to beat for value and liquidity. Today PAMP handles over 400 metric tons per year (almost 13 million troy ounces), and ensures, with vigilant attention to product quality, that its brand is recognized worldwide as a guarantee of excellence and sound provenance. 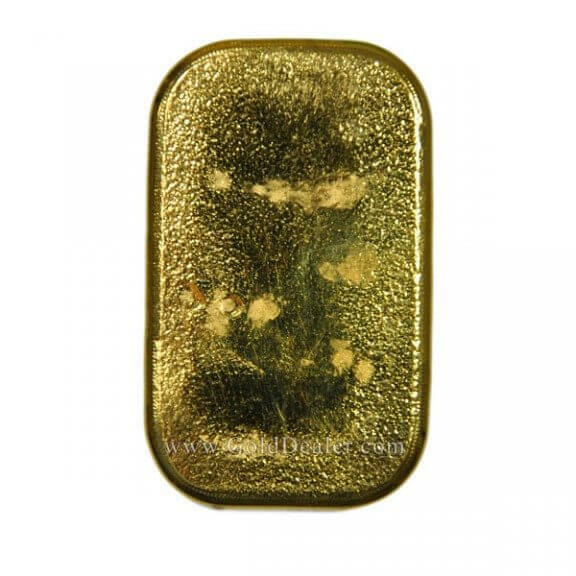 These traditional poured bars feature the usual characteristics popular with long time gold bullion investors. They have matte surfaces with bar pouring swirls and rounded edges. 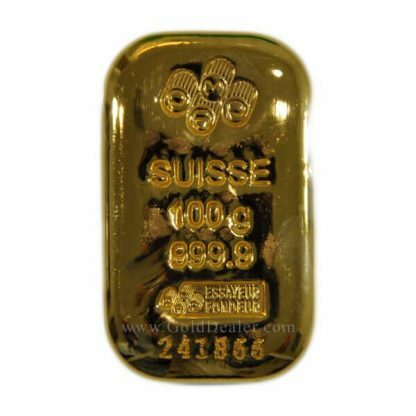 The PAMP Suisse Gold Bar 100 g (3.215 oz) is stamped with the famous PAMP Trademark, the bar’s exact weight and purity. Included is the famous PAMP S.A. Switzerland pink Assay Certificate which matches the bar specifications as to bar weight (100 g or 3.215 oz), purity (999.9 fine gold) and bar identification number (a six digit serial number stamped into the bar by PAMP). 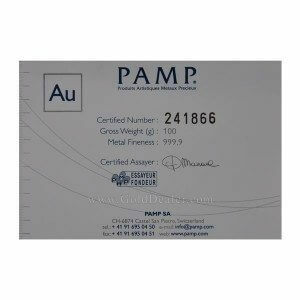 Both the PAMP Suisse Gold Bar 100 g (3.215 oz) and matching certificate are sealed in tamper proof clear plastic by GoldDealer.com to protect them for shipping, your examination and subsequent resale. There are other reasons to own this bullion standard: (1) the premium over gold content on the PAMP Suisse Gold Bar 100 g (3.215 oz) is small and so attractive to investors looking for a bullion product which fluctuates daily with the worldwide price of gold. 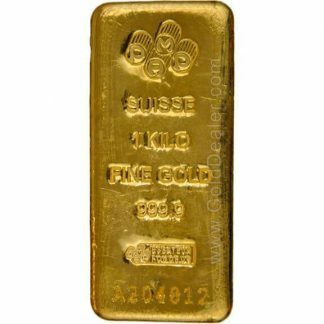 (2) Because the PAMP Suisse Gold Bar 100 g (3.215 oz) is produced by a renowned refiner its content and purity is accepted worldwide. This allows traders to post daily buy and sell prices which assures liquidity. 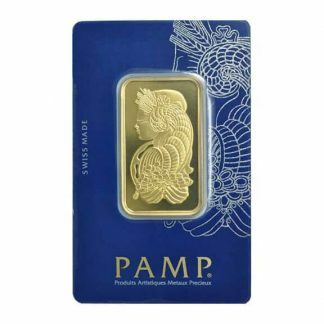 (3) Because the PAMP Suisse Gold Bar 100 g (3.215 oz) is pure it appeals to a worldwide audience including the Chinese and Asian trade another plus for marketability. 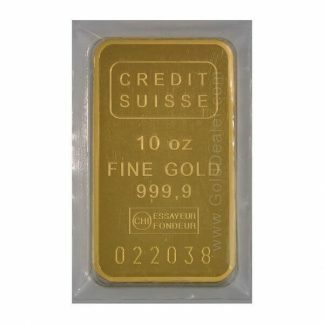 (4) The PAMP Suisse Gold Bar 100 g (3.215 oz) size is small enough to be convenient and also provides choices when buying or selling a larger gold bullion position. (5) Finally there is no reporting requirement (Federal Form 1099B) for this popular gold bullion bar when you purchase or sell keeping paperwork to a minimum. PAMP Suisse (Produits Artistiques de Métaux Précieux) is metals refinery based at Castel San Pietro, in Switzerland. nice bar, with assay card. Easy to liquidate and easy to store, can’t go wrong.